Ump Stat - Do Spring Ejections Predict Summer Action? Do Spring Training ejections predict regular season umpire ejection activity? With eight nine (while I was writing this article, there was yet another ejection) 2017 Spring Training ejections heading into the pre-season's final week, we run the numbers to answer that question of whether a discipline-laden March necessarily leads to a similar fate for the season. Hypothesis: More Spring ejections mean more regular season ones. The hypothesis of a positive correlation is a reasonable one: for instance, take the theory of a point-of-emphasis that appears in the Spring—such as one involving ejections—carrying over into the regular season and, logically, resulting in similar in-season ejection activity. REFEREE chart of our ejections data. The following report uses a particularly small sample size of five seasons, and thus, isn't an ideally statistically reliable report. Spring Training ejection information in summary form simply isn't available for seasons prior to 2012. 2017 At Least 9 TBD ? Results & Analysis: Given 2016's two ejections, the correlation is weak, yet consistently relative. In other words, the trend of "more Spring ejections = more regular season ejections" (and "less = less") is consistently true, when comparing one year and that which immediately precedes it. The trend does not hold true, however, when comparing across non-consecutive years. 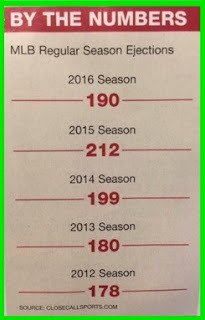 As an example, 2016's two Spring Training ejections and 190 regular season ejections positively correlates to 2015's 13 Spring Training ejections and 212 regular season ejections: the trend from 2015 to 2016 is positive and true: The season with more Spring ejections (2015) also had more regular season ejections (212). However, the trend fails when comparing 2016 to 2013 in that the season with more Spring ejections (2013) did not have more regular season ejections (180, compared to 2016's 190). On the macro level, regular season ejections have been on the rise—on the whole—since expanded replay review was introduced prior to the 2014 season, which may confound expectations. Then again, Joe Torre did, in 2016, tell managers to stop arguing balls and strikes, though this led to a rise in coach ejections in the stead of the declining managerial variety. Still, ball and strike ejections are particularly on the rise, and if 2017's preseason is any indication, the trend should continue into the regular season. Of 2017's eight nine pre-season ejections, four (potentially five) concerned balls and strikes, which is still, on its own, an increase year-over-year of 2016's two total Spring dismissals. Conclusion: Thus, the conclusion we may draw from the aforementioned data, with low confidence due to the small sample size, is that 2017's regular season should feature more ejections than occurred during 2016's regular season; 2017 should have more than 190 regular season ejections. However, the degree to which ejections may increase is unknown and subject to change and confounding variables similar to the 2016 Torre memo. Shortform: Based on historical and present Spring Training performance, 2017 should have more regular season ejections than 2016's 190, but to an unknown extent.